Another week flies by....and here we are to the weekend. This weekend we will be celebrating my in-law's 40th Anniversary. And I've been running to and fro gathering the items needed for the cake table and ingredients for the punch I'm making....busy, busy, busy. I think it will be a nice day though and we are looking forward to going "home" and visiting with each of our families. Well I've been busy learning another needlecraft! I just went ahead and bit the bullet and purchased some CTR punch needles and got busy to the learning part. Self teaching is definitely teaching on the "curve" I don't have anything that I want to show you yet...but I must say there is something satisfying in the sound and motion of the "punching" :) Sort of gets your aggression out! Thank you so much for your friendship and visits! I was overcome with all the nice things said about my Prairie Schooler finish :) I'll be round to your blogs as much as I can in the upcoming days....so keep up the inspiring work! Prairie Schooler's "When Witches Go Riding"
Pretty smack dab awesome isn't it?! I'm just thrilled to BITS with how it turned out!!!! I knew as soon as I saw these mats last year on the Bush Blog that I was going to get them. 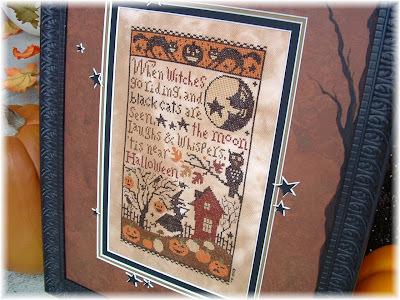 I saved up some Christmas $$$ - I don't usually buy fripperies for myself, rather for my hobby and home - and in February of this year I've had them awaiting my stitching the sampler. I'M. IN. LOVE. with this finish. 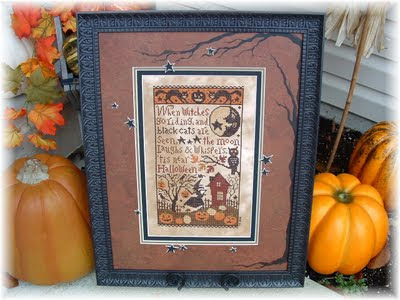 Last Halloween 2008, I was in love with my La-D-Da's "Something Wicked" finish and frame....this year, I'm in love with my "Witches Go Riding" and the Jill Rensel Mats....PERFECTION! I have both sides completed, now I'm just adding the special embroidery stitches to make it all shine! 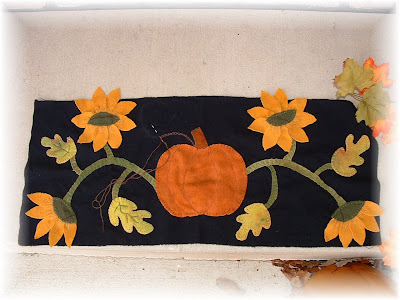 To finish this runner, I have to finish all the embroidery stitches, cut out pennies for the end, sew them together, tack them on and then sew on the backing ....then....viola! It shall be finished. I think I'm getting pretty good at wool applique, plus I like it....know what else I've been thinking abou? 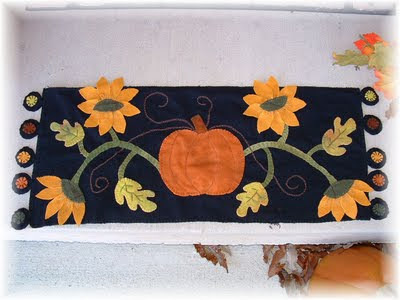 ...designing my own wool applique penny rug....in fact, I've already drawn out a design....hmmmm.....we'll see! work at the hospital. But I hope to squeeze in some stitching time for myself. I've gotten myself into a couple of personal exchanges, so I need to get hauling some rear on those. Well I better get my patootey off this computer and do some housework, or else my husband will fire me. more to go! And wait till you see the frame....oh you'll flip! for the first time in 6 years, this Mama is having a "girls weekend"!!! In Terre Haute, Indiana (about 1.5 hours west of Bloomington), there is a Celebrate Fiber weekend at Sycamore Farm! I'm going and my Mama is going to meet me up there. We're spending the night even! WHOO HOO! 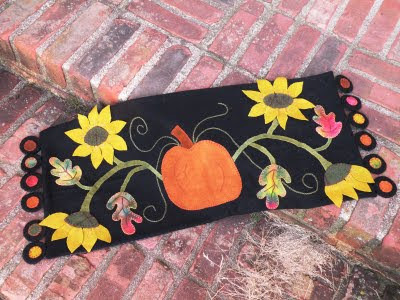 We're taking a Wool Applique Class with Lois Griffith (who is a local artisan) and we're making a Fall Table Runner (penny rug). In fact it is this one designed especially for this event! pretty doggone exciting isn't it?! I'm just tickled to bits over it! A real night away :) Cool beans! And....guess who's having a booth there at the event? Stacy Nash.... I told my husband to withdraw some money and hand it over quietly and with a smile on his face - Mama's goin' to town! 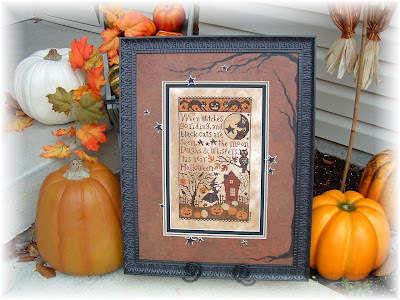 I'll be back with a weekend report and hopefully a framed "When Witches Go Riding..."
the right person shares it. This post isn't about stitching, but it is about someone and something that makes me "who I am". 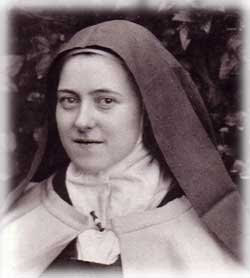 When I was a little girl growing up my most favorite Saint was St. Therese of Lisieux. I remember a Nun telling me about the "Little Flower of Jesus" and from thence on, I prayed for her intercession in my life. St. Therese's life was short only 24 years, however she packed so much into that 24 years that I imagine she beat most that would live to 100. Today (Oct. 1) is St. Therese's feast day in the Catholic calendar. Today we honor St. Therese as the person she was while here on earth. We lay our eyes on her visage and remember that she was just a human being - just as I (and you) am a human being and what I do during my time here on earth means something and can mean something to someone else too. Little ways....we all have the ability to do these things for ourselves and others. This isn't just for the "believers", it is for all of us. Little ways (little acts of kindness) are something for us all. Little ways.....practice them. They've made a difference in my life. And the next time you unexpectedly receive a flower or see a flower and comment on its beauty ~ think about it....it may be St. Therese's "little way" to you.